Creamed honey is easy to make and is well received for holiday gifts. Creamed honey is granulated honey that is started with seed honey. The seed crystals replicate themselves to a fine texture. Set in a cool place, 57 degrees is perfect for the honey to granulate. Seven to Ten days, check on it to see if is set up or not. When the plastic container is firm the batch is ready. Click on the video to get a bigger screen. Teri shows bees suffering from deformed wing virus. This virus is usually a latent virus that normally does not emerge in the bees. High Varroa infestation bring these and other normally hidden virus's to become active. This is why it is so important to keep Varroa levels as low as possible. Checking the mite load a good management technique to know where the colony is heading. This weekend looks like the end of the warm weather. Winter covers should be going on anytime now if they aren't on already. I will be covering mine next weekend. This new formic acid formulation could revolutionize the treatment of Varroa. It is in a strip format. I have not seen a picture of it. The strip goes on for 7 days. It kills Varroa on the bees and in capped cells. The bees will remove the strip or it can be removed and composted. It can even be applied during the nectar flow according to the literature because this product occurs already naturally in honey. 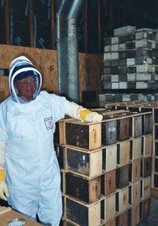 If this is the case beekeepers could treat for Varroa in late July and stop the rapidly increasing Varroa onslaught that happens in late summer. This will greatly increase a hives ability to successfully survive the winter. I don't know anything else about it but stay tuned for more information from the manufacturer and the EPA. The weather has been very pleasant. I still have not covered my bees yet. This week will be warm also with no cold weather in sight. The bees have been flying. I have been done feeding for a while now. This warm weather is great for the bees to finish up rearing brood. By finishing up having brood in the colony during this warm stretch helps the bees conserve some food for the coming winter.